Ski&Tennis: Why “pushers” are good for WTA? Why “pushers” are good for WTA? How many times have we heard tennis experts complaining about overly defensive players getting to the top of the world rankings? Solidity takes you to the top, but will not make you win slams. Or so they say. But is this really a bad thing for women’s tennis? Jelena Jankovic and Caroline Wozniacki have been world number ones for 85 weeks combined, Agnieska Radwanska has reached a slam final and peaked at world number two, Sara Errani has been a solid top 10 player with a slam final in Paris. Let us take the Pole as an example. The older of the Radwanska sisters constantly receives a great amount of criticism by the press and yet she has won the Fans' Favourite award held by the WTA for three consecutive seasons. The 2012 Wimbledon finalist does not have the power to out-hit her physically stronger opponents, but her smart reading of the game and the variety of shots in her game-plan, often set her in a position of advantage against the one-dimensional ball strikers. Probably the hottest potato is Caroline Wozniacki though. The Dane has reigned on the top of the rankings for 67 weeks, finishing the season as world number one for two consecutive years. Amazing stats, but she has never won a slam title. The beautiful blonde player from Odense has probably attracted the most criticism a world number one has ever faced. Curiously, whenever she steps on court, the crowd, more often than not, sides with her, even now that she has fallen from grace and struggles to remain in the top 10. 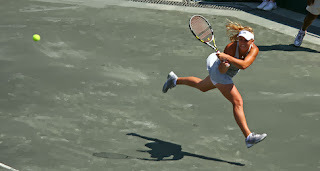 What often goes under the radar is the fact that the amazing defensive skills of the likes of Wozniacki force their opponents to always hit one or more additional balls. This consistency and athleticism exposes the weaknesses of most of the hard hitters and makes the matches more mentally demanding. One could say that they make their opponents play badly, which is not far from the truth. Their defensive game is the key to forcing opponents’ errors and at the end of the day, is that not just as much of a weapon as a massive forehand or deadly slice? Another argument in support of the “pushers” is given by their long-term consistency. Their rankings are based on numerous solid results and a level of play that may not peak as high as many other players on tour, but rarely sinks as low. Last, but not least, they provide a spectacle. It may seem a paradox just after my point on their ability to make others play badly, but when watching their matches, the intensity of their rallies and the variety of solutions to turn defence into attack is what keeps the crowd on the edge of their seats. A flashing return winner may result in loud applause, but a long and intense rally, ending with a winner on the run, makes the public jump and scream.